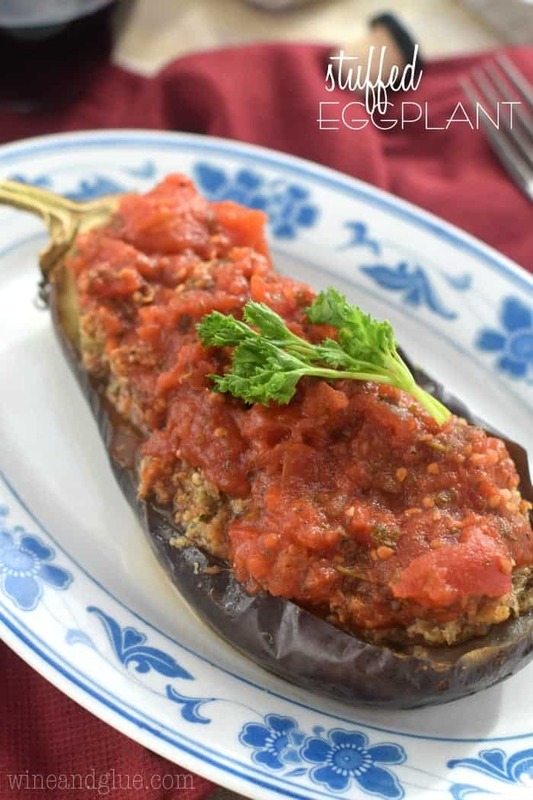 Stuffed Eggplant | Delicious eggplant stuffed with spicy sausage and topped with homemade red sauce! When I went to my dad’s house for Christmas I found the jackpot. A cut out newspaper article with recipes from my Italian Grandmother. 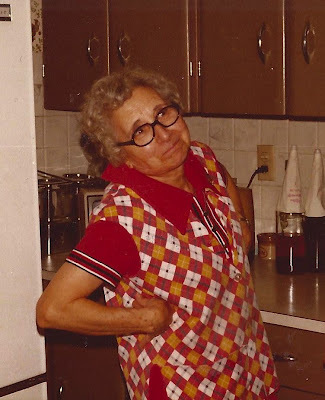 She was the most amazing cook on the planet. I know. I’m biased. And that sounds just crazy. But she was. It was as if she was this amazing scientist who had figured out the formula for how to get love into food. 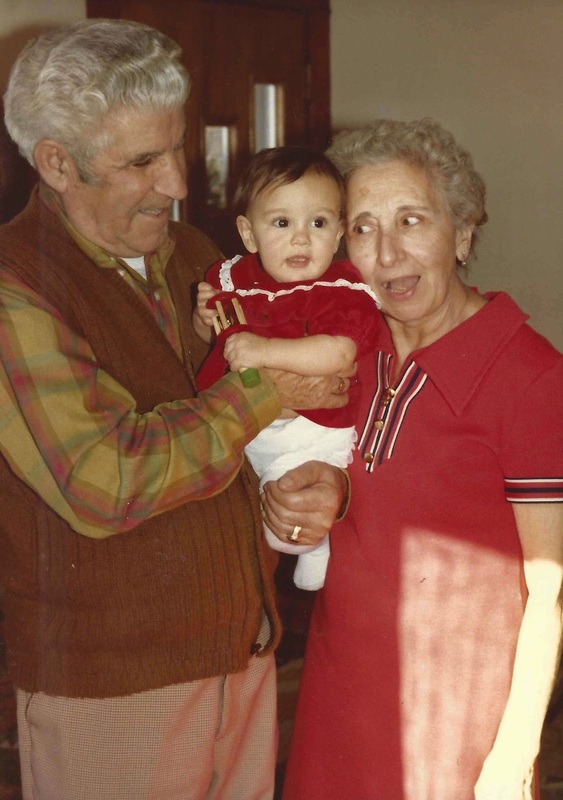 My Grandma came to the United States from Italy with her mother when she was 12 years old. Her father had come here when she was 2 to work and save enough money for his wife and daughter to join him. Less than two months after my grandmother and my great-grandmother arrived here, he died of a brain tumor. I come form a long line of strong women. My great-grandmother stayed in this strange country with her young daughter, eventually remarried, and built a life for my grandmother. Family was everything to my grandma. 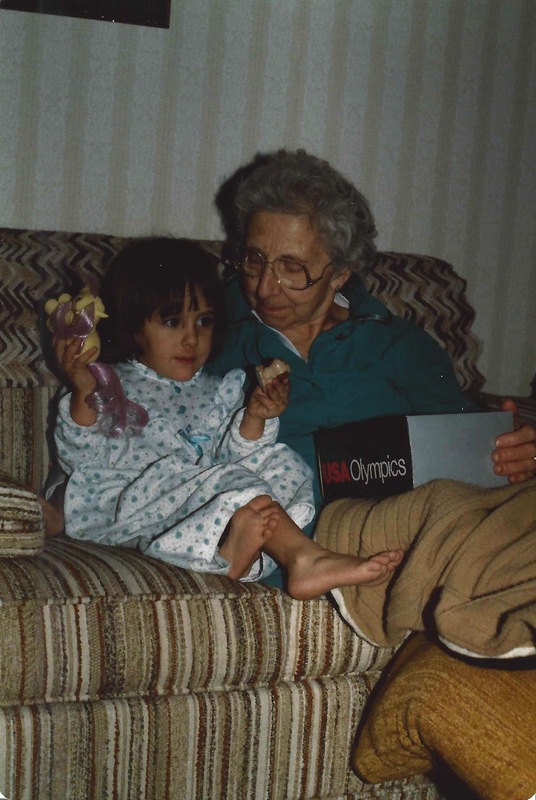 My mom spoke very highly of her mother in law, she talked about how when we would show up once a month to visit, my mom was able to drop everything, and my grandma would pick up where she left off, taking care of us and cooking for us. 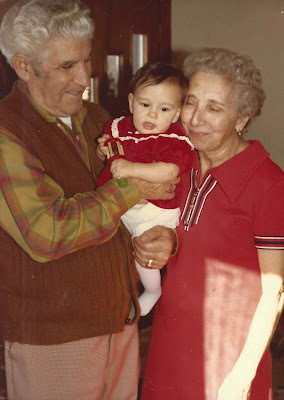 I remember that when we would arrive, we would run to the basement where there was an extra oven and find where my grandma was keeping the meatballs warm. We’d snag some out of the ceramic bowl before we ran off to play. When I was born I was the first granddaughter for my grandma after eight grandsons! And I was lucky enough to have her dote on me. Also, is it any wonder that I’m a little nutty? Look where I came from. Anyway, enough of my old family photos. We were headed to the awkward years anyway. Back to the love and the food. My grandma’s food was amazing. If that woman put out a cookbook today, it would be a best seller. My dad used to always tell me about how she would make hundreds of ravioli by hand to help feed his high school football team. There was only one problem with her cooking. She never wrote down her recipes!! My mom told me that she would chase my grandma, who passed away when I was eleven, around the kitchen, trying to write down what she was doing. “How much salt was that? ?” my mom would ask. “I don’t know, a dash!” my grandma would respond. So in a way, all this amazing cooking was sort of lost. So when I saw this newspaper article with six, SIX, of my grandma’s recipes it was like hitting the jackpot! (I have no idea, by the way, why she was featured in her local paper. I didn’t even ask. Or read the article. I was in a trance from seeing her recipes written down!) So far I have tried two, stuffed eggplant and biscotti, and tasting them is like being a small girl sitting in her kitchen with my family while she refuses to sit down and makes more food to love us with. On to the Stuffed Eggplant!! I halved this recipe (though I will list the full recipe at the bottom), and it was a big lunch for two people. It would have made a good dinner for four with a salad and some pasta. 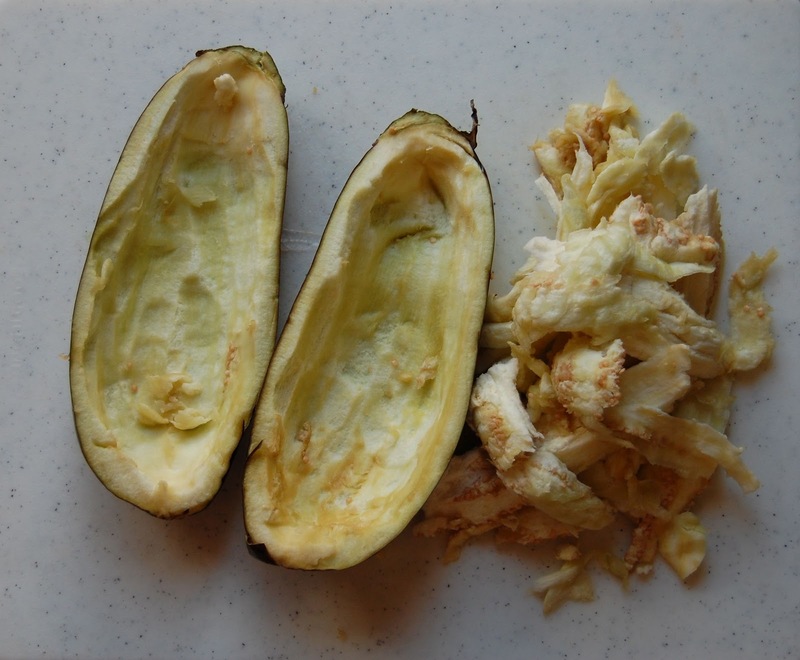 Start by cutting an eggplant in half, and gutting it. Blanch the eggplant, or, if you aren’t a chef either, look on Wikipedia and figure out what that means. 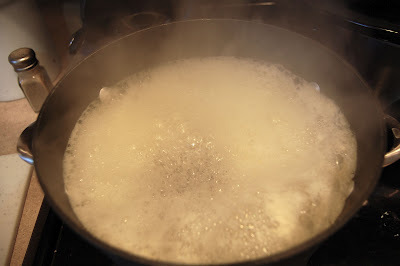 Four minutes in boiling water. 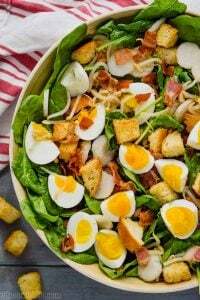 Drain, chop the innards, and combine them with meat, egg, and breadcrumbs. While the eggplant is baking, make some sauce. Of course you could top this with jarred sauce, but the homemade sauce is super easy and I feel like it is what really makes it taste like lunch at grandmas. 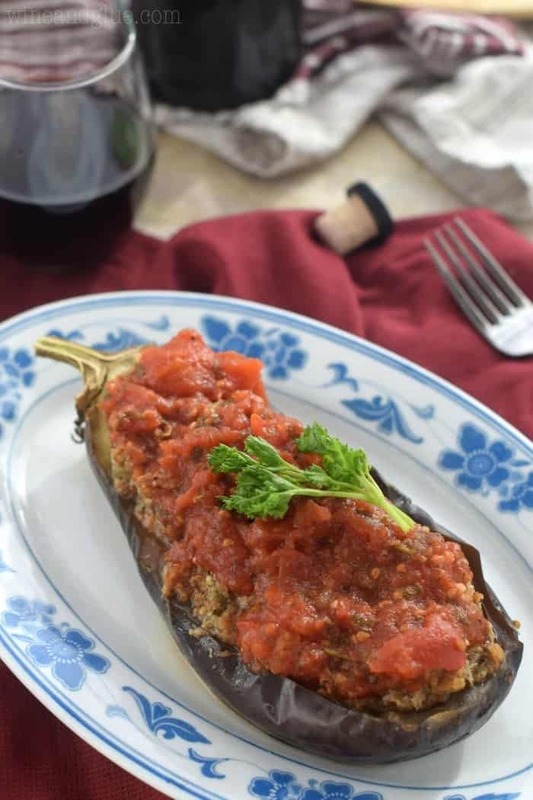 Take the eggplant out of the oven, top with the sauce and put it all back in the oven for 10 minutes. Cut eggplants in half. Scoop out the pulp with spoon. Blanch the eggplant pulp and shells in boiling water (with a little salt thrown in) for 4 to 5 minutes. Drain well. Let the eggplant cool, then chop the pulp and mix it with the bread crumbs, sausage (raw), eggs, parsley, pepper, salt, and garlic salt. Fill the eggplants with the mixture, put it into a well oiled pan, and put it in the oven for 30 minutes. While the eggplants cook, make sauce. Combine all ingredients in a medium saucepan over medium low heat. Once the sauce is boiling, use a potato ricer to smash up the tomatoes. Turn the heat down and let the sauce simmer while the eggplant finishes cooking. After 30 minutes, top the eggplant with the sauce, and put it all back in the oven for 10 minutes. This post makes me so happy. I believe John and Sara will be served Stuffed Eggplant ala Grandma when they visit next week. I love love this post! Your newest follower! Can you please share at my Taste This Thursday party!? Oh, your Grandma looks so cute! 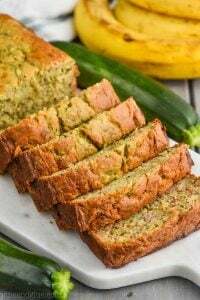 I can’t wait to try this recipe, it looks delicious! I found you on the Saturday blog hop, and am now a follower. Thanks!!! New followers is better than Christmas morning! They look amazing! Grandmas are the best cooks! Found this through Frugal Girls. 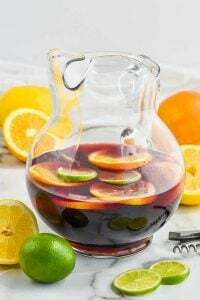 Thank you so much for posting, cant wait to try this and the meatball recipe!! My grandmothers never write down their recipes either! I am always trying to re-create them. Loved this post! My grandmother came from Italy as a young girl as well so I know what those “love” recipes are all about. 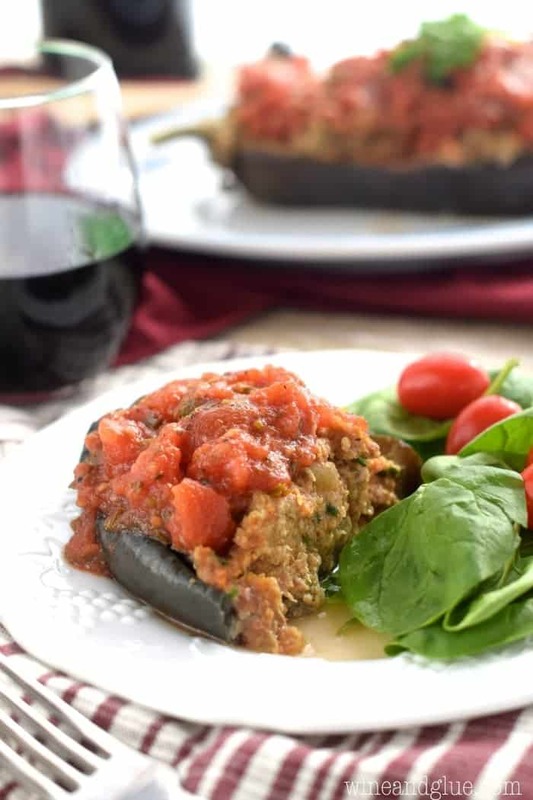 I’ve never seen a stuffed eggplant one though, and I LOVE eggplant so this one will be tested. I know I will be getting a pinch of YOUR grandmother’s love. Sigh…I sure do miss mine as I’m sure you miss yours. Sigh, aren’t these grandma recipes the best?? This is by far my favorite one! It is so delicious. I could eat it once a week. Thank you so much for stopping by! I love that you found this recipe, and that it can live on now. We as sons and daughters of cooks have to remember, too, that our kids are going to want to know how we make their favorites. We have to trust ourselves and our ability to create, just as our parents did. I always forget how much I love eggplant!! Love this. And the family photos! 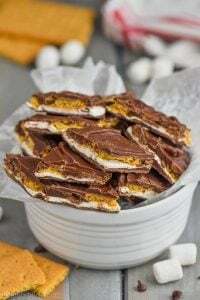 Thanks for this recipe! I’ve added it to the Farm Fresh Feasts Visual Recipe Index by Ingredient, a resource for folks like me who love to eat from the farm share. I appreciate your help in making this index better!